Thinking the words Essential Garden Tools sounds like work. The correct device for the garden chores at hand lightens the load. Do they make for easy vegetable gardening? Enjoying working in home vegetable garden also makes it easy and fun. Essential garden tools are hand operated, Of Course. Axes, machetes, shovels, pruners and garden shears work best when sharp. ..... Cultivating tools and others with handles need special attention. Keeping the handle tight in the holding bracket provides for safe and productive use. Well oiled wooden handles are easier on the hands. put in the storage shed after use. 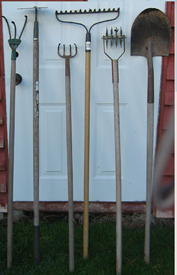 The good care of gardening tools and equipment makes our gardeners work easier. 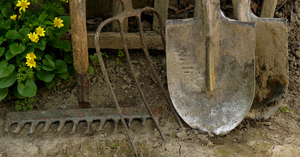 Garden spade and a garden shovels are used for digging garden soil, turning in compost. 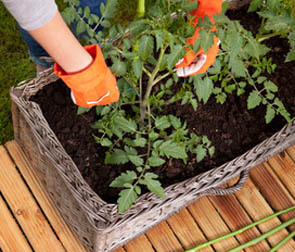 work well with these basic garden tools. 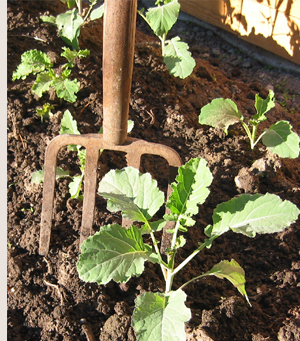 The garden fork, a hard working garden hand tool. In good soil and compost it will turn and aerate organic matter with ease. 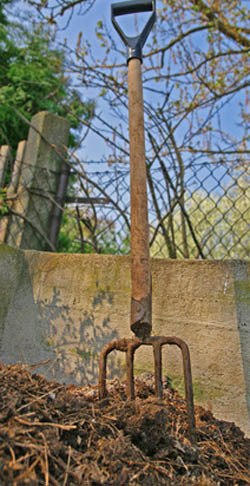 Garden rake, used for smoothing and leveling garden soil. ... will help chop prunings and organic garden debris helping it break down quicker. ... will be needed to moisten compost and soil ... helping with organic matter decomposition. Rain barrel and a water wand are also helpful when irrigating by hand. Wheelbarrows for movement of garden soil ... mulch ... and organic compost. Keep the spreader clean after use and put away out of the weather. ... When small space gardening and intensive gardening fertilize by hand. is not for this purpose. 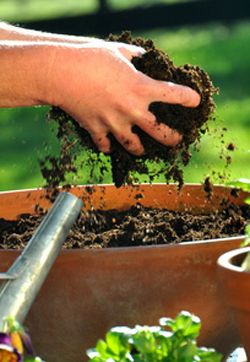 Using a bulb planter he removes a plug of garden soil and replaces it with good fish compost. My friends the growing tomato plants rave about this method of treating them. Adaption of hand gardening tools. Yes ! ... require smaller planting tools including your hands. ... will be helpful for transplanting as well as when container gardening. 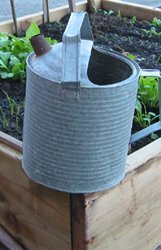 Watering can is used to give the transplanted vegetable plant seedling a drink. ... 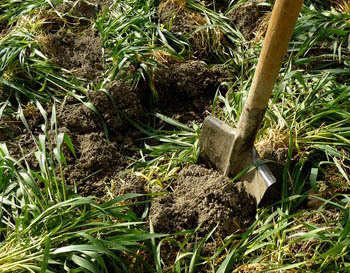 When used for weeding the hoe will slice the weeds off close to ground level. ... Hand rotary cultivator or claw type work well disturbing our roots little. 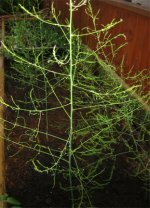 ... work in the top three inches of the garden soil removing weeds. ... allowing water to pass through the soil with ease. the vegetable row are close together with garden paths between. 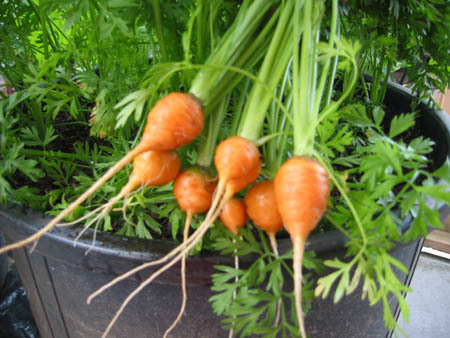 Harvesting a small vegetable garden will make use of some of the same essential garden tools. ... cutting vegetables from vining plants ... and harvesting your home grown tomatoes. Garden baskets for harvesting the vegetable garden crop is handy. ... hauling away the great garden bounty ! Where does he get his essential garden tools from ? ... passed down through generations of gardeners. Over the years the tools came from friends, garage sales, and diy gardening stores. 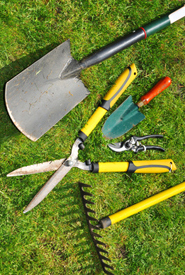 an online gardening tools and supplies catalogue. They will show you what garden tools you might need and much more. The favorite basic hand gardening tools of our gardener are the shovel, garden rake and hand hoe. By adapting the use his tools he attempts to keep the garden tool shed reasonable. easily accessible or most economical to acquire.